Secretary of State John Kerry called on the Taliban to get peace talks “back on track,” after the recent breakdown of negotiations. “Now we need to see if we can get it back on track. 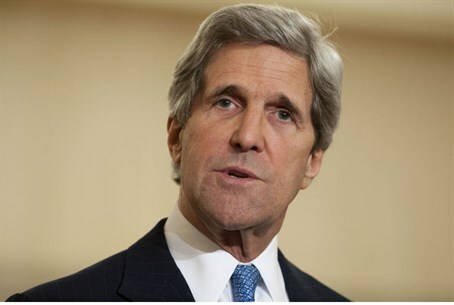 I don’t know whether that’s possible or not,” Kerry said on Saturday at a press conference in Qatar. The potential peace talks between the Taliban, U.S. and Afghan government got off to a shaky start, as Afghan President Hamid Karzai withdrew after the Taliban flew a flag at the Doha office that said “Islamic Emirate of Afghanistan,” the name of the former Taliban government in Afghanistan, The Hill reported. “If there is not a decision to move forward by the Taliban in short order, then we may have to consider whether or not the office has to be closed,” Kerry said. “And it is our hope that this could ultimately be an important step in reconciliation if it’s possible. We know that that – it may well not be possible, and it’s really up to the Taliban to make that choice,“ he added. On Tuesday, Afghan security forces took over responsibility for security operations from NATO forces. The U.S.-led NATO coalition intends to withdraw all combat troops by 2014, leaving a residual support force.